Raleigh, NC -- Billboards in North Carolina are advertising something a little unusual. The billboards advertise a date for the return of Jesus. A family put the signs up across the state with the date "May 21, 2011." 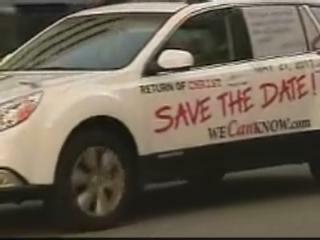 There are also cars with "Save The Date" across the side. The family follows the controversial radio ministry of Harold Camping. The so-called Christian leader's radio show isn't broadcast in North Carolina, so they say they moved there to spread his message. Camping says he figured out the actual date by calculating 7,000 years from the day that Noah took pairs of animals into his ark to save them from the flood.